CAIRO (Reuters) - Moderate has become a dirty word in Egypt. Since the army ousted Islamist president Mohamed Mursi, anyone who refuses to support either side uncritically has become a traitor to both. Polarized attitudes of "you're either with us or against us" have forced Egyptians in the middle ground to disappear largely from political view, making any reconciliation between Mursi's Muslim Brotherhood and the army-backed government ever more remote. This raises the danger of yet more of the bloodshed that followed the fall of Egypt's first freely-elected president in July. Both sides are hardening their positions in what is already the most turbulent period in the internal history of modern Egypt, a U.S. ally that has a peace treaty with Israel. Experiences of two one-time members of the National Salvation Front (NSF), an alliance of liberal and leftist parties, shows how moderates can come under verbal or even physical attack from the pro-military or Islamist camps. One is Mohamed ElBaradei, who served briefly as vice president under the army-backed interim government but resigned after security forces crushed pro-Mursi sit-ins on August 14, killing hundreds. ElBaradei, who won wide respect abroad as head of the United Nations nuclear agency for more than a decade, got few thanks at home for taking a stand against political violence. Newspaper columnist Mustafa Bakri described ElBaradei's resignation speech as a "stab in the back of the Egyptian people". 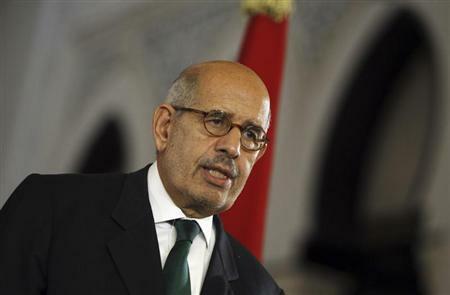 ElBaradei has now left the country. The other is Khaled Dawoud, a former NSF spokesman who suffered even worse - but at the hands of the other side. Even though he resigned from the secular alliance because it had backed the crackdown on Mursi supporters, Dawoud was attacked by pro-Islamists who stabbed him several times. "Without a doubt, it was an assassination attempt," Dawoud told Reuters at his Cairo home, his left hand still healing after one of his attackers dragged a knife across his forearm several times while he was trapped in his car during a protest. Moderate voices have been drowned out in the Egyptian media which largely glorifies the army and its chief, General Abdel Fattah al-Sisi. An absence of established political parties to encourage dynamic pluralist politics has also pushed moderate politicians into the background while the public, weary of instability, mostly backs the army in its "war against terrorism". Dawoud rejects any suggestion that his opposition to the August crackdown reveals sympathy for political Islam. "I'm a strong opponent of the Muslim Brotherhood. They're my ideological adversary, but I don't want to kill them," he said. "I'm not against August 14 because I love the Brotherhood ... but because I'm scared for my country. When 400-500 of them die, they'll have relatives, friends and siblings who say there is no solution but revenge," he said. Political scientist Emad Shahin said the Egyptian media ensured that real moderates would be silenced. "If you're against the coup, then you're with the Brotherhood. If you're with the Brotherhood, then you're a terrorist. And if you are for democracy, then you are a fifth columnist. That is how it's calculated," said Shahin, who is a professor at the American University in Cairo. When an uprising toppled Hosni Mubarak in 2011, Egyptians hoped for an era of democracy that would bring political and economic stability to the most populous Arab county. Many grew disillusioned with Mursi, the man they elected to replace Mubarak. Mursi was accused of usurping power and mismanaging the economy; millions protested against his rule, prompting the army to step in. Since then, many Egyptians have associated the army with stability and rejected the views of others. The Brotherhood and its supporters say the repression is worse than the decades under Mubarak, and they worry about the intolerance. Kamal Aboulmagd, a lawyer who tried to start a mediation effort, lamented a "wave of intimidation" against anyone who takes a moderate line in the crisis, which has severely hit tourism and investment in Egypt. "The moderate voices are badly needed and it should be a group of people who are willing to sacrifice," he told Reuters in his Cairo office by the Nile. "I call them living martyrs. They will be condemned and accused by both sides, but if they're sincere, they shouldn't care at all. It's an attempt to save the country." But a lack of serious progress in mediation efforts is also discouraging for the small number of people who have tried. Aboulmagd said he had met two Brotherhood officials in the last two months to persuade them to stop staging protests demanding Mursi's reinstatement. "It was a very clear message. You have to make some concessions, you can't stick to your absolutist approach," he told them. While he said their response was "not bad", it seemed that the top leaders - most of whom are in jail - did not agree. Protests have since continued, frequently ending in bloody clashes with security forces and political opponents. Aboulmagd, who had not yet met army officials, said security forces had to stop arbitrary arrests, which he warned would antagonize a "larger portion of public opinion". The government has said it is committed to reconciliation and accuses the Brotherhood of undermining efforts to resolve the political turmoil. The Islamist group says dialogue is unrealistic given that most of its leaders are in jail. After decades of political stagnation under Mubarak, many new liberal parties emerged but have failed to become a viable force, particularly against the Brotherhood which has dominated elections since the uprising. "The majority of Egyptians are still not used to a multiplicity in the political scene," said Mohamed Menza, head of the politburo at the Egypt Freedom party, a social liberal party headed by political scientist Amr Hamzawy. "This sort of diversity or multiplicity is not welcomed among the masses. Unless you have a conviction of awareness or belief in the importance of a discourse on rights ... you ally yourself with either the military or the Brotherhood." Abdel Moneim Abol Fotouh, a former presidential candidate who says he was against Mursi's rule but wanted the president removed through early elections, accused the media of ignoring views critical of the army. "We used to get 20 TV channels a day asking for an interview. Now they don't come and even if they did, they cancel on the day under some pretence," he said. Abol Fotouh quit the Brotherhood in 2011 to make an independent bid for the presidency and is the founder of the Strong Egypt party. Abol Fotouh cited ElBaradei's treatment after he went abroad. "He left to a place of silence. And despite his exit and his silence, a lawsuit was brought against him accusing him of major betrayal," he said. "I have differences with him, but we shouldn't morally assassinate him." Abol Fotouh told Reuters the army crackdown would further radicalize Islamists. "If we say they're (the Brotherhood) a million, they each have five sympathizers, are you going to cleanse five million citizens to get rid of the movement?" he said. "We don't want to leave religious fascism that could have controlled Egypt except to fall into military fascism." Some nationalists accuse the Brotherhood of seeking to build a caliphate across Muslim states. "The Brotherhood's goal is an Islamic empire, anywhere. That ideology poses a big risk to the national security of any nation and that is the case in Egypt," an army colonel told Reuters. But Ahmed Maher, a leader of the April 6 movement that played a prominent role in the anti-Mubarak uprising, warned of extreme views on Egypt's streets. "People just hate each other. They say 'let them die'. That never used to be the case before. That really scares me," he said. "The only thing that will bring these people together is for them to realize the magnitude of the catastrophe." Since Mursi's overthrow, near daily protests and clashes have taken place between Islamist supporters and security forces. Islamist militants, who the army believes are in cahoots with the Brotherhood, have also targeted police and security forces in the strategic Sinai Peninsula that borders Israel and the Palestinian Gaza strip. That leaves little room for moderate figures to maneuver. "We're in a very difficult position. I'm not a hero. I'm a normal person. It's too much for me to bear to always be accused of being a traitor and an agent. That's what stops us going down that road," said Dawoud. Intensifying militant attacks on the security forces make it harder to call for army restraint, said Dawoud. "The more violence that takes place, the weaker the moderate voices become. I'll shut up whether I like it or not."